The Venti probe is the United Nations Space Administration (UNSA) robot probe for the Tau Ceti mission. Venti is the Latin word for ‘wind’ – an allusion to its primary mode of propulsion. The epic scale of such an undertaking presents significant technical challenges. The probe needs to travel farther, faster and for longer than any other man-made machine. Only thanks to recent advances in engineering, materials technology and computer systems was UNSA able to construct a vehicle capable of crossing the vast gulf of interstellar space to the system of Tau Ceti. As well as its primary objective, Venti will pass through one of the two Sun Dragon entities heading out of the solar system. The previous Chase missions have confirmed that the alien is dormant during its outbound travel phase. However, the Venti probe has been hardened in case of attack from the Sun Dragon entity. The design phase began in early 2091 and took three years of concentrated effort to design the mission. There were many challenges to overcome, not just technical, but for planning and operational support. Not since the ill-fated Mars Voyager had mankind put together a space mission on this scale. Construction of the probe started in Low Earth Orbit (LEO) as soon as the plan was approved and took six years to complete. The resources needed to put the mission together were phenomenal, and involved every major national space agency and private space corporation. The probe’s payload mass is 70 tons, not including fuel for the MPD drives. It is approximately 20 metres in size and is dwarfed by a solar sail which has a surface area of 9 square kilometres. The probe will launch from LEO in April 2099. The mission to Tau Ceti is unparalleled in human history. While several earlier missions have reached the outer regions of the solar system and a much smaller number, such as the Voyager probes, have entered interstellar space, this is the first mission intended to reach another star system. The 12 light year journey requires propulsion systems capable of extreme endurance and with little or low fuel needs (and therefore mass). It’s also important that they be easy to maintain and repair, since with a mission lasting well over 200 years, failure is likely to occur at some stage. 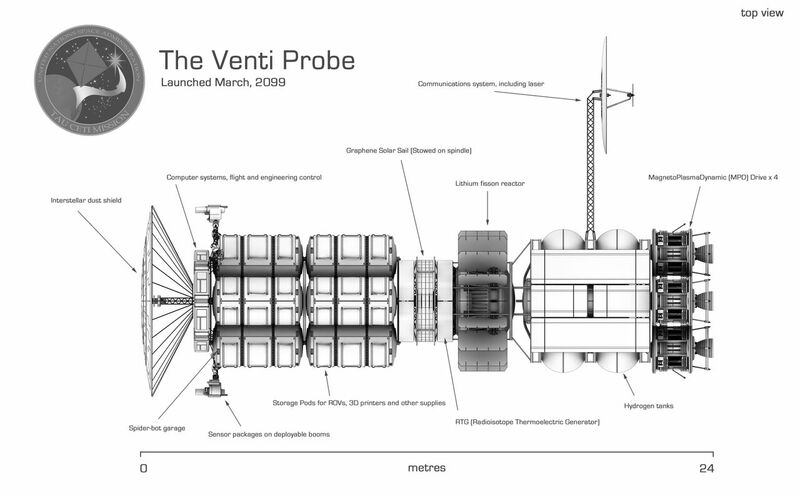 The Venti probe operates two different propulsion systems – a graphene solar sail and MPD (MagnetoPlasmaDynamic) drives. It also has a set of canisters for pressured gas propulsion, which are used for emergency manoeuvres only as they require fuel. 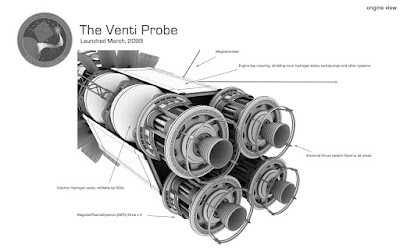 As well as the two propulsion systems, Venti will be assisted by gravity transfers from several major bodies in the solar system and from two booster sleds equipped with nuclear impulse drives. The graphene solar sail is an advancement from the experimental sail systems used in the late 20th and early 21st century space missions. The solar sail uses pressure from the solar wind streaming from the Sun against the thin material to push the probe. Like sailing ships, the sail can be angled to allow a direction of travel at angles different to the vector of the solar wind. Compared to the more familiar chemical rockets used for launch, the solar sail creates very little thrust. The rockets use a large amount of fuel to generate immense amounts of thrust, but only for a short time. The sail uses no fuel and so can be used to continually accelerate the probe up to 5% of the speed of light, although it will take decades to reach this speed. The graphene layer reacts with the energised particles of the solar wind, producing an additional thrust effect from the sail. Entwined with the graphene patches are carbon nanotubes providing rigidity and anchors to allow the patches within the sail to be angled to adjust direction of travel. Overall the sail is 9km2 and dwarfs the actual probe by a considerable margin. Despite its huge size, the ultra-thin material of the sail is incredibly light and adds little mass to the probe. The MPD or MagnetoPlasmaDynamic drive is an advanced form of ion drive. Unlike the solar sail, the MPD drive requires hydrogen fuel, although the burn rate is quite low and the mission design allows for Venti to refuel itself along the journey. The drive works by ionising the hydrogen gas and then forcing it through electromagnetic fields, the resultant jet producing thrust. It was only recent advances in power generation technology that made this drive possible. Like the solar sail, the MPD drive produces much smaller thrust compared to chemical rockets. It is capable of firing for extended periods and generates higher thrust than the sails. For the outbound journey, Venti will be accelerated using the booster sleds and the solar sail. The MPD drive’s primary purpose is for the deceleration burn on approach to the Tau Ceti system. As it enters the system, the drag from the solar sail will assist the slowing down of the probe. The sails provide some manoeuvring capability, but not enough for quick changes in direction. A secondary vectored thrust module for each drive allows directional thrust. For this reason there are four MPD drives fitted to the Venti probe. Generating sufficient power for extended space missions has always been a challenge. For any mission into the outer solar system or beyond, there is insufficient electrical power from solar panels to power a probe, and the MPD drives of the Venti probe require more energy than the rest of the probe’s systems combined. Smart power management is used to keep the power requirements as low as possible, so the probe’s sensory and scientific packages are powered down while the drives are operational. The sail has embedded photo-electrical cells which provide power. When the probe is too far away from a star then it relies on the nuclear fission generator at the heart of the probe. This is a lithium cooled reactor and while of an efficient design, the fuel required for its operational life of over 200 years forms the bulk of the probe’s payload – not including the fuel for the MPD drives. Unlike the MPD fuel, it is impractical to refuel the reactor and this determines the likely lifespan of the probe. As a back-up system, the probe also has an RTG (Radioisotope Thermoelectric Generator) system which uses radioactive decay to produce heat and electricity. This system lacks the power to be able to energise the MPD drive, but can maintain the computer and science systems when they are in power-saving mode. 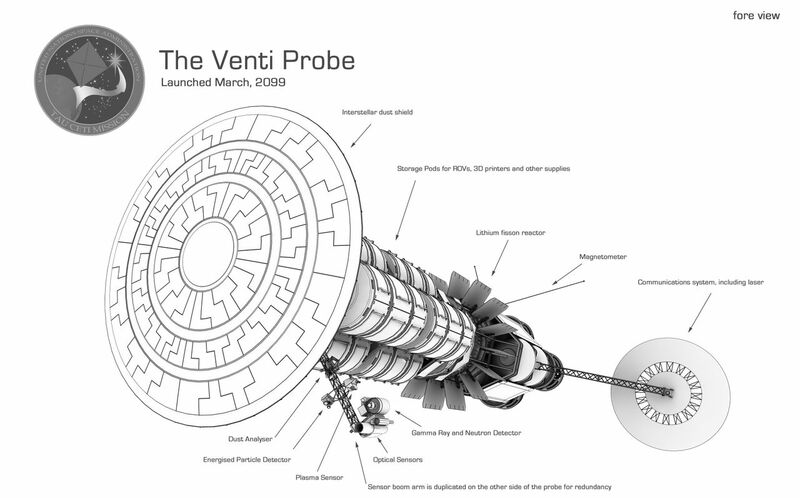 As with any space mission, the goal for the Venti probe is to amass data and as a result discover new science. In particular it is intended to solve the mystery of the Tau Ceti signal. In spite of the setbacks caused by the damage of the Sun Dragon encounter, we have learned much about the outer regions of the solar system. Even so, there is little information available on what the probe will encounter when it reaches the Tau Ceti star system, so its science package is designed to include as much sensor technology as possible. The sensors are a mixture of active and passive systems. Active sensors like radar transmit a signal and use the response to determine information about the probe’s surroundings. Passive sensors like the telescopes rely on received input for assembling information. All of the ROVs (Remote Operations Vehicles) are equipped with a basic sensor package of optical, multi-spectrum electromagnetic, and thermal passive and active sensors. ROVs are also used for distributed science tasks like gravimetric measurements. The sensor packages are modular so extra instruments can be added to the ROVs for specific tasks. Most of the sensors are embedded in pods that are secured within the protective shell of the probe and deployed on extendable arms when used. A few are placed into the skin of the probe for navigation and situational awareness for the Venti as it travels. Optical sensors use light (including beyond the visible spectrum such as ultraviolet and infrared) as input, and they exist in two forms. The first, such as telescopes, use the light directly for observation. The second type use light indirectly for secondary analysis, such as spectrographs. Similar in nature to the optical sensors, these operate at different wavelengths of the EM (electromagnetic) spectrum like radio and radar. Low-powered lasers are used for range finding and spectrographic analysis of gases and vapours. Two high-powered lasers are also available to create gas or vapour samples from liquids or solid materials. The EPD (Energised Particle Detector) is used to detect ionised particles and exotic particles like neutrinos. The plasma sensor is used to measure plasma activity and composition when the probe passes through a region of gas that has been heated or effected by magnetic fields to form plasma. Physical samples can be retrieved by ROVs or analysed in situ by them. Used to scan and measure atmospheres and clouds by using varied wavelengths to determine composition and pressure. Elements and isotopes within the rocks create certain emissions as they decay, such as neutrons and gamma rays. These can be used to determine ages, composition and some kinds of geological activity. Used to detect the strength and direction of a magnetic field. Used to analyse dust particulates and measure dust density. With a mission duration measuring beyond two centuries, the Venti probe needs to be more self-sufficient than any space mission ever launched. As it travels farther away from Earth, its ability to transmit data is reduced so it cannot rely on sending back raw data for analysis. This means that it has to be done by the probe. Combined with the fact that it would be too far away to rely on instructions from mission control, Venti needs to be capable of making decisions beyond the basic operations of the probe. Space missions can be perilous for delicate electronics, especially for tightly packed circuits such as those used in processors. With the components so close together, even a stray particle or cosmic ray can damage the chip. As with previous space missions, this is mitigated by using older electronics that aren’t as vulnerable as they don’t use such small fabrication techniques. Sensitive areas are also protected by layers of ultra-dense alloys to block as many potential threats as possible. The computers are stored within gel which provides further shielding as well as shock protection and heat management. Potentially the greatest challenge for the mission is the unknown nature of what it will encounter when it reaches Tau Ceti. The computer system needs to be capable of making decisions in unusual circumstances, but would also need to have as much information at its disposal as possible. The sum of human scientific knowledge is contained within the probe. More than that, it needs to be able to apply the knowledge in novel ways. To achieve this, Venti has a number of computer systems. Each has a dedicated purpose. Most operate in a similar fashion to traditional computers and manage the core systems of the probe. As with all aspects of the mission, part of the longevity is enabled through multiple redundancy with physical and logical backups. The command functions are handled by two separate neural networks. They lack the specialisation of the system management computers, but are capable of self-organisation and updating their operating software. Their neural nets also enable them to learn. Such complicated software needs capable hardware to run on. The risks of cosmic radiation and the need for easy maintenance means that the latest hardware can’t be used. Instead the command systems use a matrix of micro-sized computers. They operate at a slower pace to contemporary computers to better regulate heat and facilitate modular repairs and maintenance. The PCM (Prime Command Module) is the operational command system for Venti. This is a free-form artificial intelligence utilising a neural net architecture, capable of interpreting data from the management systems and formulating plans of action in response to changes in situation. Since it was first activated early in Venti’s construction phase, the PCM has run continual simulations of all variables pertinent to the mission. As part of its training, its decisions were vetted by teams of experts to fine-tune its decision making processes. Although the PCM controls the probe, it’s the Secondary Command Module which will take charge if a first contact scenario occurs. The SCM (Secondary Control System) acts as a backup for the Primary Control Module. Unlike the physical and virtual backups, it is constantly operational and appraising the decisions made by the PCM. If the PCM is deemed to be making unsound decisions then the SCM takes over while the PCM is repaired, assuming repair is possible. The SCM has a tertiary function as the public relations representative for the mission while it is in flight. This wasn’t part of the original mission profile and grew from its practice of natural language comprehension and expression during its training for first contact scenarios. Another consequence of its natural language skills was a more human-like contact with the mission team, earning it the nickname of ‘Seb’. The engineering control computer monitors and regulates the maintenance of the probe’s many systems. It provides warnings of any failures and operates the robots that perform physical maintenance and repairs. It is capable of acting autonomously to keep the probe operational if it receives no instructions from either of the command modules. This operates and provides an interface to all communications systems. In the event of the command modules failing, it has a hard-coded back-up system to send telemetry and sensor data back to Earth. This would normally be filtered keep the quantity of data manageable, but when in back-up mode a less precise and ‘lossy’ form of compression is used. This degrades the quality of data, but compacts as much as possible within the available bandwidth. That bandwidth decreases the farther from Earth Venti travels. The sensor system manages and provides interfaces the various science and sensor packages. It is capable of complex analyses, but only those pre-programmed into the computer. The command systems are capable of altering these or creating new ones. All of the probe’s navigation and flight control systems are managed together and it provides the interfaces for these functions. In the event of the command modules failing, it is programmed to continue the trip to Tau Ceti and then fly past each of the planets. The mission plan requires Venti to remain operational for at leastmore than 200 years, which presents a major technical challenge. It’s common on space missions to build in redundancy and the Tau Ceti mission follows the same ethos. Redundancy to the level needed for this length of time would add too much mass to Venti, so that meant that the probe had to be able to repair itself. To affect the repairs, the probe is equipped with two sizes of spider-bot. The smallest are microscopic and used for repairing circuitry and small-scale components. The larger versions are 30cm across and can work in groups to perform larger repairs. The probe is constructed as much as possible with components which can be swapped out by the robots. They also perform routine maintenance for mechanical and electrical parts. Three 3D printers are also equipped with patterns for every component on the probe. This is supplemented with stores of raw materials. The ROVs can also be used to gather replacement materials if needed. Effective and direct communications between Venti and Earth become ever more problematic the farther away the probe travels. The basic technology of an ultra-high-gain radio antenna in the X band frequencies remains the same as for earlier robot explorers of the outer solar system. The increased energy available to the probe offsets the problem somewhat, but the data rate fall-off is still very restricting. This again is partially mitigated by advanced compression techniques and pre-processing by the onboard communications systems. The data will be analysed so the full quantity of raw data doesn’t need to be sent. For significant encounters and at the discretion of the two command systems, blocks of raw data can be sent back to Earth. Receiving radio transmissions from Earth is easier as more energy is available to the ground and orbital transmitters. It is expected that Earth can remain in contact with the probe all the way to Tau Ceti. 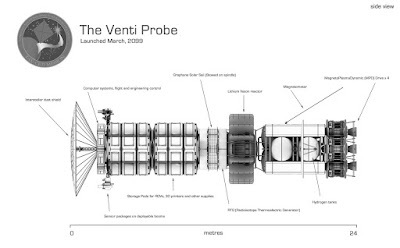 It is considered unlikely that the Venti can reliably transmit radio data once it passes the three-quarters mark of its journey. 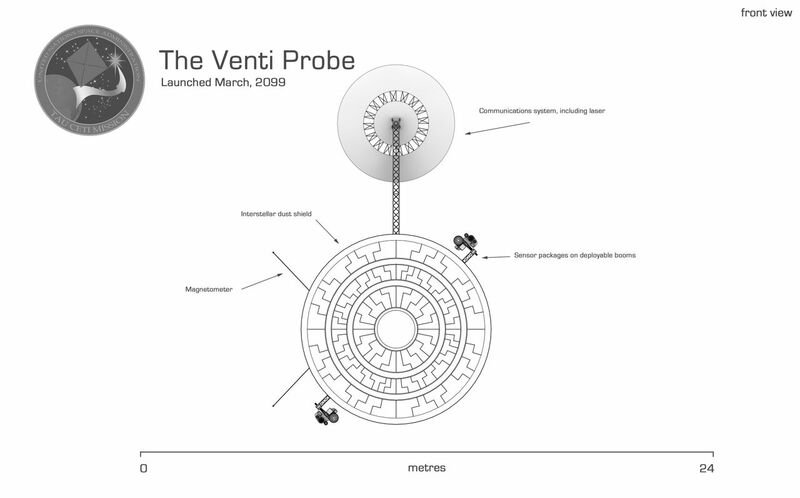 Venti also uses a laser communications system, a more advanced version of the one used on the Mars Voyager mission. The laser transmitter has the advantage of needing less energy to transmit the same amount of data. Keeping the laser in alignment is the greatest challenge and to make this easier, a group of large receivers has been positioned in Earth orbit. As an emergency system, 12 mini-sats are available, each equipped with a single-shot burst transmitter. The Venti is provisioned with eight Remote Operations Vehicles. Four of these are a generic configuration for collecting samples. Two are equipped for hydrogen mining to refuel the MPD drives. The remaining two are sensor platforms for the distributed science packages such as the gravimetric sensors. The ROVs lack the power to operate their own MPD drive and so use a less powerful xenon-based ion drive. The probe is able to create new ROVs from the stored templates for the 3D printers.